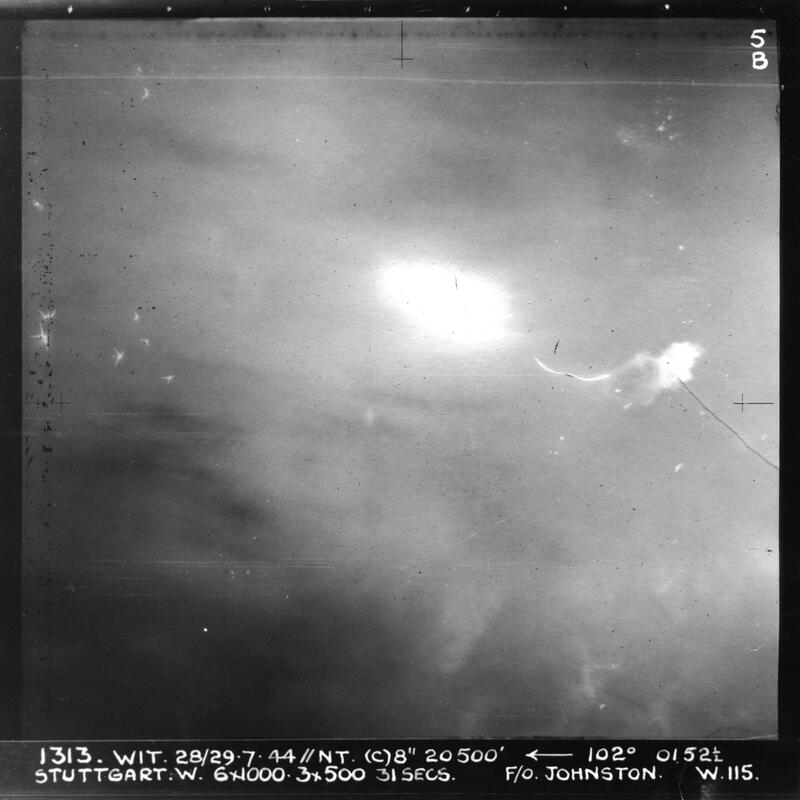 There was a bright moon on this mission, and German fighters intercepted the bomber stream while over France on the outward flight. The result was that 39 of the 494 Lancasters, or 8% of the force, were shot down. One of these was Johnston’s friend Alex “Red” Campbell, who was based at 514 Squadron at Waterbeach. The story of that final mission in Campbell’s own words appears at the end of the Colleagues section. Mossie - Mosquito bomber. 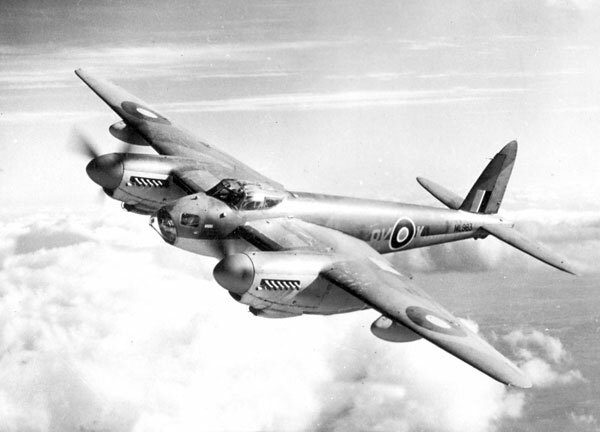 The RAF’s Mosquito, or “Mossie”, was a versatile twin engine plane, with a mainly plywood construction that made it both agile and faster than any fighter. It was durable, could fly to altitudes above 10,000 metres, and had exceptional combat range. These features made the two person plane invaluable not only as a bomber, but as a fighter, a Pathfinder, and for photo reconnaissance. Bombed at 01:51 and a half - Dropped their bombs at 30 seconds after 1:51 a.m.
Well, got number thirteen off not too badly – only trouble was getting coned near Orleans. I don’t know yet what I did but I was in that cloud so fast! We dodged one fighter in the clouds but aside from that and the usual flak we had a quiet trip. Flew to France at 10,000 then down to between 7,000 and 9,000 (up to our discretion to use cloud cover as we saw fit). After being coned near Orleans I was shaken so badly that I got right in the cloud and stayed there until we had to climb for the target. Mannheim was a blaze of searchlights and flak as usual when we went past. We saw one or two chops on our starboard as we went in. Bombed the flow from Green and Red TIs at 21,000 ft.
Flew out of the target at about that height for about ten minutes then down to the cloud cover again at 240 mph 1,500 feet per minute. Flew out at that height, climbed to 16,000 over the Channel and let down from Reading. Was at 9,000 over base because I stayed up to watch the most beautiful cloud formation I’ve ever seen – it looked just like a landscape done in sunset colours with trees and bushes and fields all in gold and dark shades. It was wonderful – you’d swear it was the real thing if you didn’t know better. It was absolutely uncanny! I made a poor landing – came in the funnel OK but couldn’t find the runway in the half light and had to skid into it in the last minute. In this cone at Orleans we saw someone else get the chop in it just as we were coming up to it but I figured I’d missed it by far enough – I hadn’t. It took about ten seconds after they got him coned before he blew up in the air – Lord it was fast! It’s Dave’s birthday since 12 this morning. Johnny celebrated his on a daylight over the beach head and now Dave over Stuttgart. This raid was supposed to flatten the one remaining part of the city which was left after two heavy bomber raids and one Mossie raid. We lost about 35 aircraft out of 450 on this target. None from here though happily – we bombed at 01:51 and a half.